From Cedar road drive until you get to the T-junction. Turn left onto the R114. Drive exactly 1.1km and turn left onto a sand road. There will be a big green and white “Cash for Scrap” sign at the 1.1km mark. Follow the sand road until you see a big white wall with our Ark logo. We are inside the wall. From Hans Strydom/Malibongwe drive towards Lanseria until you get to where the the Lion Park use to be(Currently its a 4-way stop). Turn right at this intersection onto the R114. 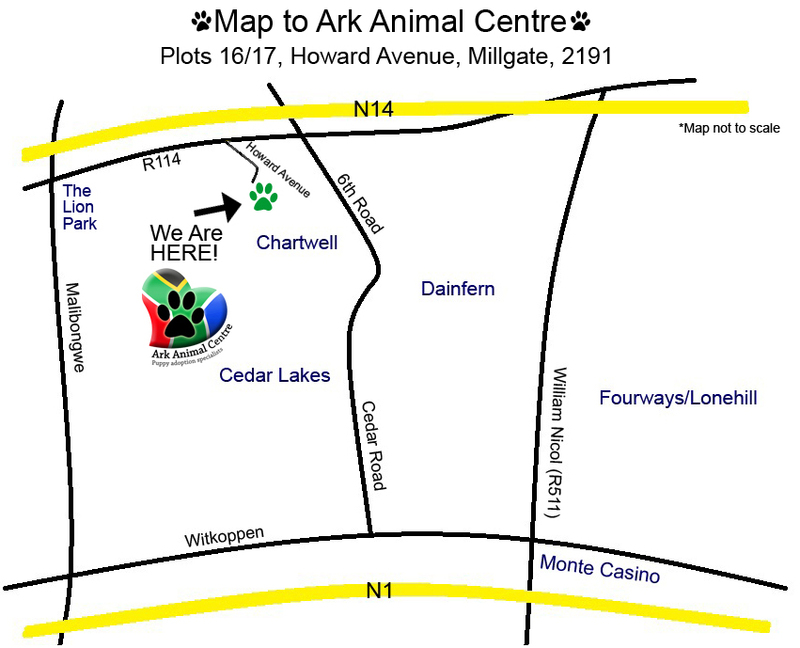 Drive about 2km and turn right at the Ark Sign onto a sand road. Follow the sand road until you see a big white wall with our Ark logo. We are inside the wall. From Centurion get onto the N14 and take the R512 off ramp and turn left. At the next robot which is the old Lion Park intersection (Currently its a 4-way stop) turn left onto the R114. Drive about 2km and turn right at the Ark Sign onto a sand road. Follow the sand road until you see a big white wall with our Ark logo. We are inside the wall.